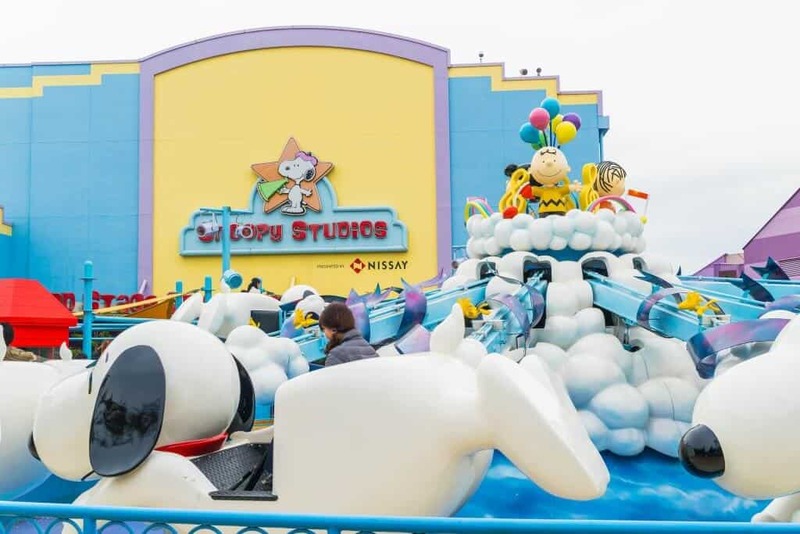 Rather than recreating previous Universal theme parks in Orlando and Hollywood, Universal Studios Japan has developed and expanded new and existing rides, incorporates Japanese entertainment franchises and has a more “Japanese” feel to it than the Tokyo Disney parks. It also has a universal appeal that any international visitor would love as well. The official hotels also offer a unique and fun experience, and is located steps away from the park. Having never visited any of the other Universal theme parks, I can’t compare Universal Studios Japan against the others. I can only say that USJ was thoroughly enjoyable and cemented my love of roller coasters and theme parks. It’s easy to get to, and has an amazing variety of rides and attractions. 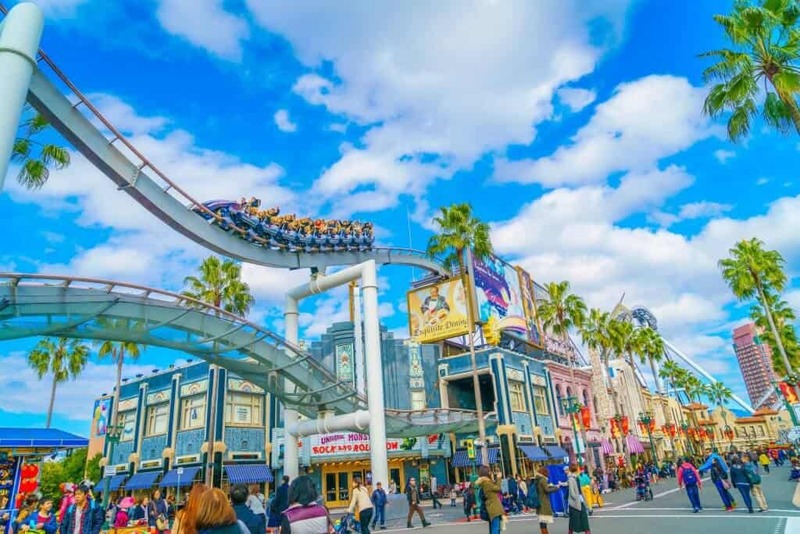 If you’re spending time in Osaka, visiting Universal Studios Japan should be high on your list of things to do. Universal Studios Japan is divided into 9 areas, each with themed attractions, buildings and sometimes stores and restaurants. Although not expected to open until 2020, a tenth Nintendo themed area featuring characters such as Mario is currently in development, replacing the area used for events in the East part of the park. A must for Harry Potter fans. 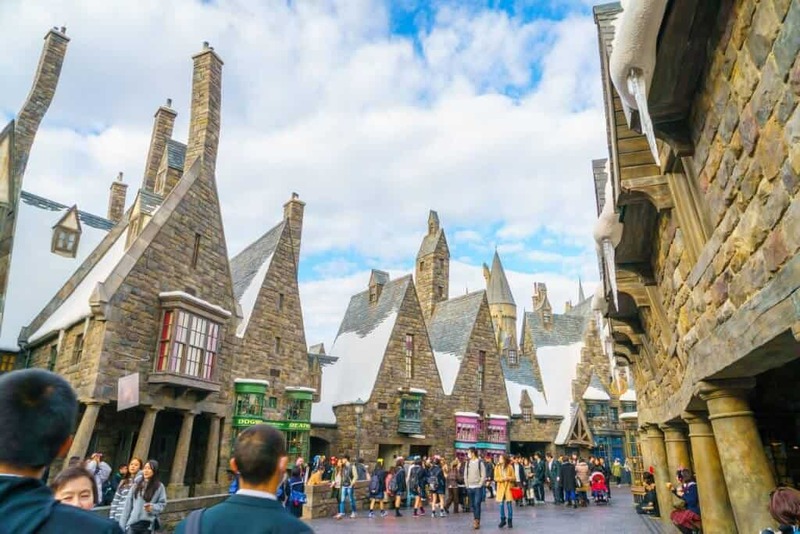 Since it opened in 2014, the Wizarding World of Harry Potter has been incredibly popular with visitors. So popular in fact, that you can’t enter the area whenever you want. Entry to this part of the park is regulated by time tickets intended to prevent overcrowding. These tickets can be picked up at the Universal Studios Japan ticketing office inside the park or are included with the purchase of most express tickets. Just head over to the Wizarding World for admission at the time that is printed on your ticket. Be punctual—if you miss your time, you won’t be allowed in. Once in the Wizarding World, there is no time limit to how long you can stay. *Note: If seeing Harry Potter World in USJ is a must, get your timed entry tickets ASAP. I got my tickets right when the park opened at 9:00am. My entry time was at 1:00pm. Although I did go when the Harry Potter section was new, it is still always very busy. So my advice would be to get your entry tickets first, before doing anything else. The highlight of the Harry Potter attractions is the 4D ride Harry Potter and the Forbidden Journey. Deemed the best ride in the world for the past five years, the Forbidden Journey uses groundbreaking 4K3D technology to produce an immersive experience. The ride takes participants on a high-speed chase above Hogwarts in pursuit of the Golden Snitch. 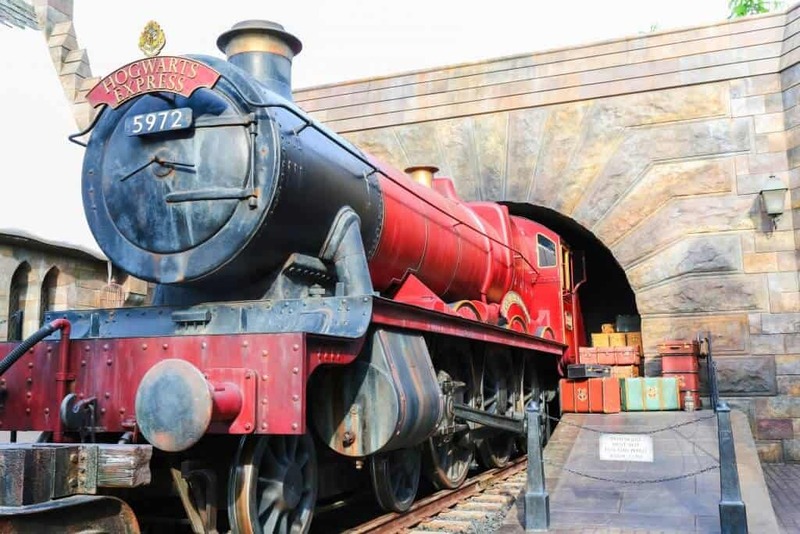 The ride is located within Hogwarts Castle, which recreates in loving detail locations from the Harry Potter books and movies, including Dumbledore’s office, the Defense Against the Dark Arts classroom and moving portraits. If you arrive at Universal Studios Japan before the park opens and go immediately to the ride, you can avoid a 2-4 hour wait. Yes, you heard me correctly…a 2 – 4-hour wait. At any other time, an express ticket is a must for this extremely popular attraction. The only other Harry Potter themed ride is the Flight of the Hippogriff, a family-friendly coaster that simulates receiving a Hippogriff handling lesson from Hagrid. Keep in mind that for both rides, the voice-overs are in Japanese only. However, you will still enjoy the experience! 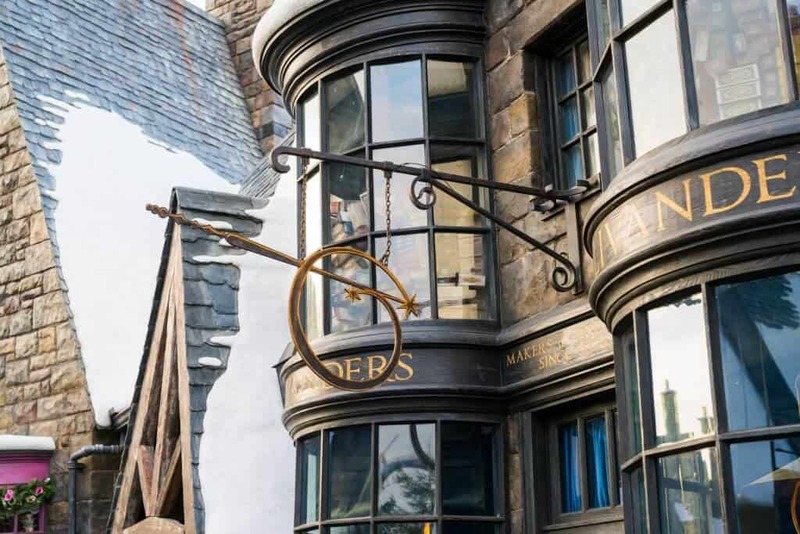 Once you’ve had your fill of the rides, explore Hogsmeade, the wizarding village. There are multiple Harry Potter themed restaurants and shops. 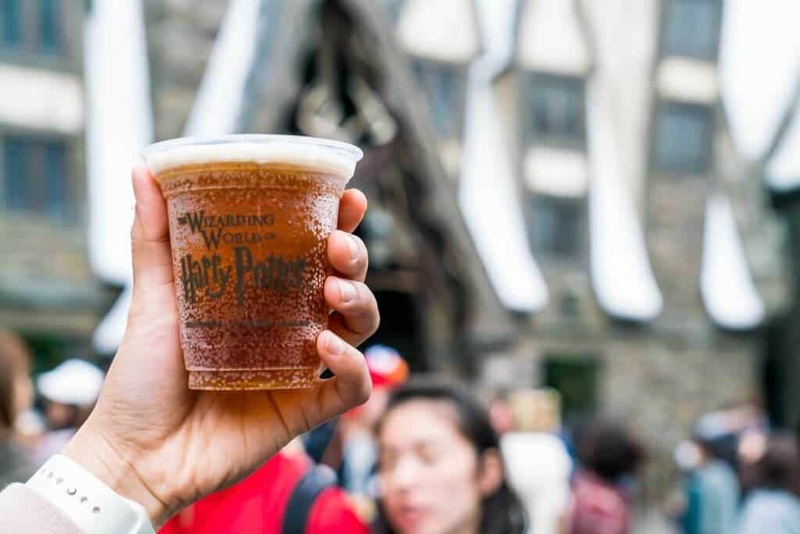 Having a butterbeer at The Three Broomsticks or the Hog’s Head is a must, and, depending on the season, may be available frozen. If you purchase a wand from Ollivanders, you will be able to use it to cast a spell at eight locations within the park (point your wand where directed and repeat the spell. Magic!). Wiseacre’s Wizarding Equipment shop has a range of Hogwarts-themed collectibles, including robes and ties. For more clothing, go to Gladrags Wizardwear or Filch’s Emporium of Confiscated Goods. Otherwise, send a letter via an owl through the Owl Post, or purchase Harry Potter themed stationary. Dervish and Bangs has quidditch equipment and uniforms, and Zonko’s Joke shop has everything a budding prankster needs. Honeydukes sells a variety of sweets including chocolate frogs and Bertie Botts Every-Flavour Beans. **Note: These shops can get really busy as well. When it’s busy, there are lines just to get into the store. During busy times (national Japanese holidays, summer vacation for kids, weekends, etc.) the wait can be over an hour. I recommend visiting and exploring the Harry Potter area first, since it usually is the busiest and has the longest wait times. Universal Wonderland is the probably the park’s second busiest area. This area includes Snoopy Studios, Hello Kitty Fashion Avenue, and Sesame Street Fun World. 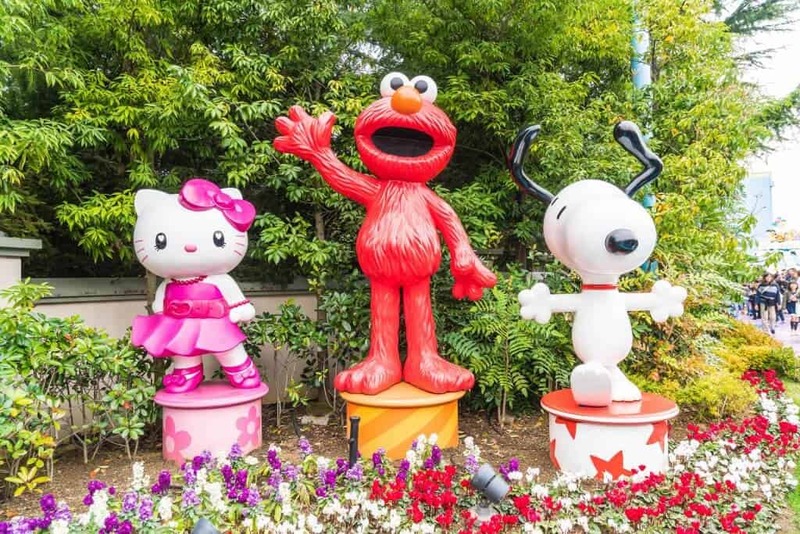 This part of the park is aimed at families, with kid-friendly rides like the Snoopy’s Great Race Coaster, the Flying Snoopy Carousel, and Hello Kitty’s Cupcake Dream, a spinning teacup ride. 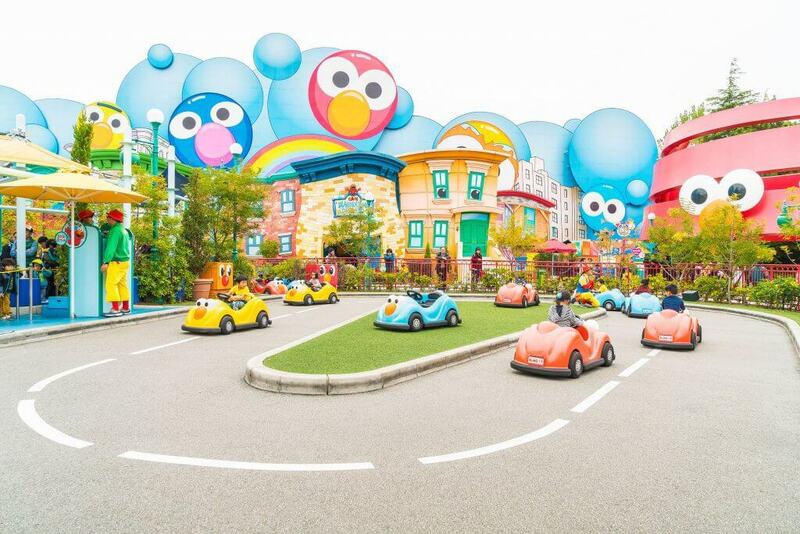 There are 6 Sesame Street themed rides including Elmo’s Go-Go Skateboard and Moppy’s Balloon Trip. There are also play equipment and games featuring popular characters like Big Bird, Bert, and Ernie. Because Universal Studios Japan is a popular destination for Japanese families, unless you’re traveling with younger children or are determined to ride every ride in the park, I recommend leaving it until late in your visit to explore. 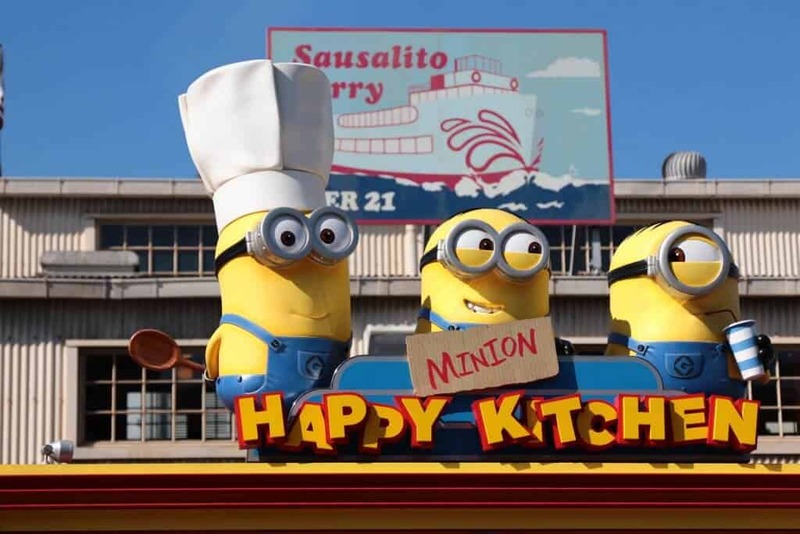 Inspired by the success of the Despicable Me franchise, Minion Park is dedicated to these cute, yellow minions. Experience becoming a minion yourself on the ride Minion Mayhem, then try to win the unicorn toy from the movie at Space Killer. Looking for Minion character goods? Head to the aptly named Minion Market Place. The main attraction of New York is the Amazing Adventures of Spider-Man ride, which features the 4K3D technology used in the award-winning Harry Potter ride. Unsurprisingly, the ride won world’s best ride for seven consecutive years until it lost the crown to the Harry Potter Forbidden Journey. 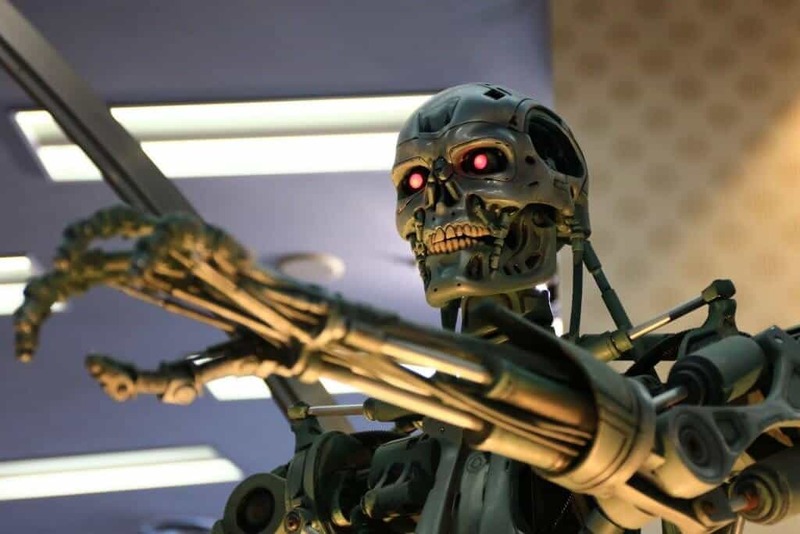 The Terminator 2: 3-D is a theater experience that brings the world of the Terminator franchise to life before your eyes. The dining options include two pizza places, Louis’ N.Y. Pizza Parlor and Azzurra di Capri and an Irish style pub called Finnegan’s Bar and Grill. There is also the Park Side Grill Steak House, and Saido, a Japanese restaurant. Universal Studios Japan themed goods can be found in Universal Studios Souvenirs, while everything Spiderman can be found in The Amazing Spider-Man Store. With a Wall of Fame of its very own, and more street and theater shows than any other section of the park, Hollywood is a fitting homage to Universal Studio’s origins. Hollywood contains three rides, including the coaster Hollywood Dream-The Ride. It’s a thrilling roller coaster that allows riders to choose a personal soundtrack to accompany their journey. At certain times during the year, it is possible to ride “Hollywood Dream-The Ride-Backdrop,” which is the same ride with the trains facing backwards (closed January 12-February 23 2018). The other ride attraction is Space Fantasy, a 10-minute ride dodging asteroids through outer space, that ends with a plunge straight into the sun (closed November 6-12 2017 and January 6-12 2018). Food options range from American burgers with the diner experience at Mel’s Drive-In and Studio Stars Restaurant to the French-inspired Beverly Hills Boulangerie. There are a wide variety of character goods for sale, including stores devoted to Peanuts, Hello Kitty and Seasame Street characters, and souvenir stores covering the entire park. Studio Gifts West includes a Tax Refund counter where you can show your passport to get tax back on purchases of goods above 5,000 yen (visitors to Japan only). The San Francisco area at Universal Studios Japan is a good place to escape the crowds. It has only one attraction and four restaurants. Backdraft is a fire special effects show, showing how the pyrotechnic effects in the Backdraft movie were created (currently closed until November 2017). The restaurants include a cafeteria, buffet and a Chinese restaurant, the Dragon’s Pearl. As fitting for an area devoted to a dinosaur-themed theme park, the Jurassic Park section has two fantastic rides. The Flying Dinosaur is ranked among the best rides at Universal Studios Japan. The flying coaster simulates the experience of being seized by a Pteranodon, and includes a 37.8-meter drop (closed January 19-25 2018). Jurassic Park The Ride is a log plume ride that takes you past familiar dinosaurs from the movie, and ends in a thrilling drop (closed February 13-23 2018). You can purchase a raincoat before the ride, but if you’re visiting the park in summer, I wouldn’t bother. It’s hot, and you’ll dry off quickly. Be sure to take advantage of the free lockers to store your valuables before the ride! Movie fans should head to the Discovery Restaurant, which recreates the visitor’s center from the movies. The Lost World restaurant features South American food, and there’s popcorn at the Fossil Fuels snack stand. Jurassic Outfitters sells Jurassic Park themed goods. The sleepy sea-side town Amity from the movie Jaws is beautifully recreated, and the iconic Jaws ride is the main attraction here. The 7-minute tour starts out peaceful and relaxing, but ends in flames and Jaws himself. I have to admit, that despite the stiff competition from other rides, Jaws was my personal favorite. This is another ride where get a little wet (Jaws ride closed February 26-March 7th 2018). The Amity Landing Restaurant sells fried chicken, and snacks are available from the Amity Ice and Boardwalk Snacks. 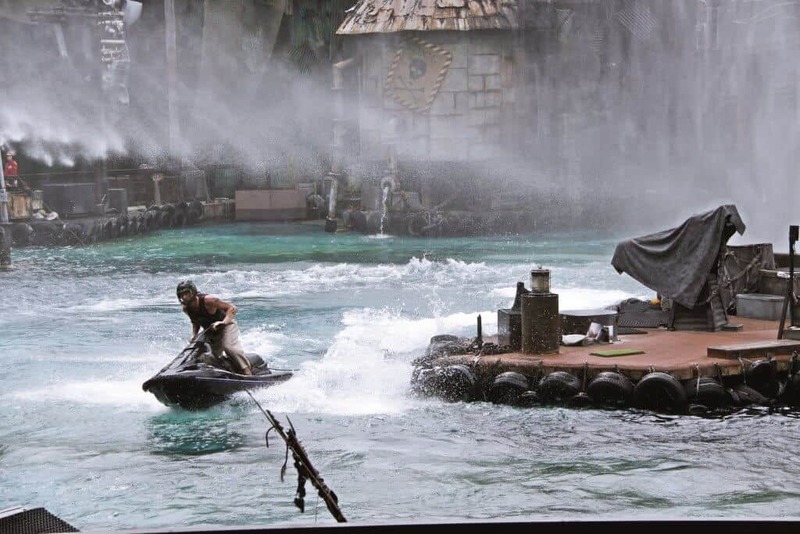 Waterworld is a 20-minute stunt show, featuring motorboats, jet skis and fire, recreating a tense battle scene from the movie of the same name. Again, come prepared to get wet, if you sit near the front. 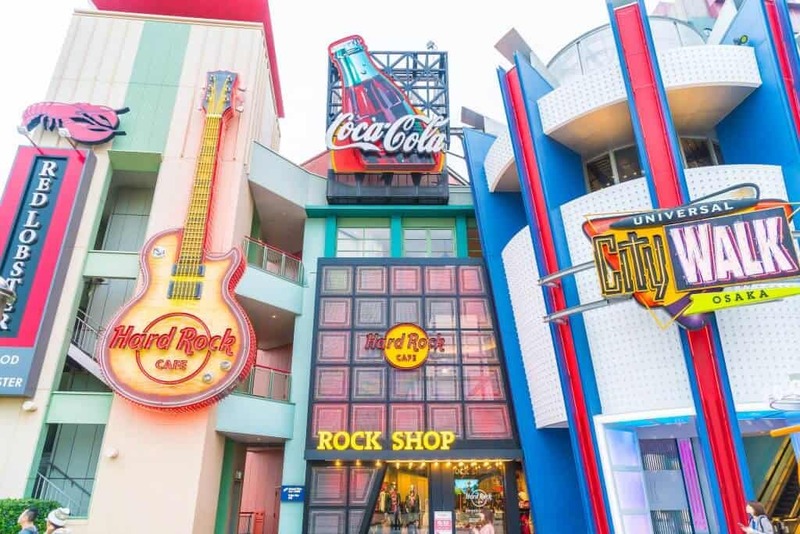 Linking Universal Station to the park itself, Universal Citywalk is a three-story mall that includes numerous shops, restaurants, a takoyaki museum (takoyaki is a regional specialty of Osaka), and a 10-screen cinema complex. Although you can’t re-enter the park after leaving it, you might want to consider eating here. The food is much more reasonably priced than inside the park, and there is a range of international food options you’ll have trouble finding elsewhere in Japan. I ate the best ribs I ever had in Japan at Universal Citywalk. Is Universal Studios Japan Worth It? How much you’ll enjoy Universal Studios Japan depends on your capacity for crowds and queues. Don’t try to do everything. I love rides, so I prioritized my must-do attractions, hit them up early in the day, and then dipped in and out of shops, restaurants, and shows around the park. Coming up with a plan for your”must-dos” is a necessity even during the weekdays. Make sure that you don’t miss the time on your timed entry tickets (where applicable), and you’ll be hard-pressed not to have a great time. 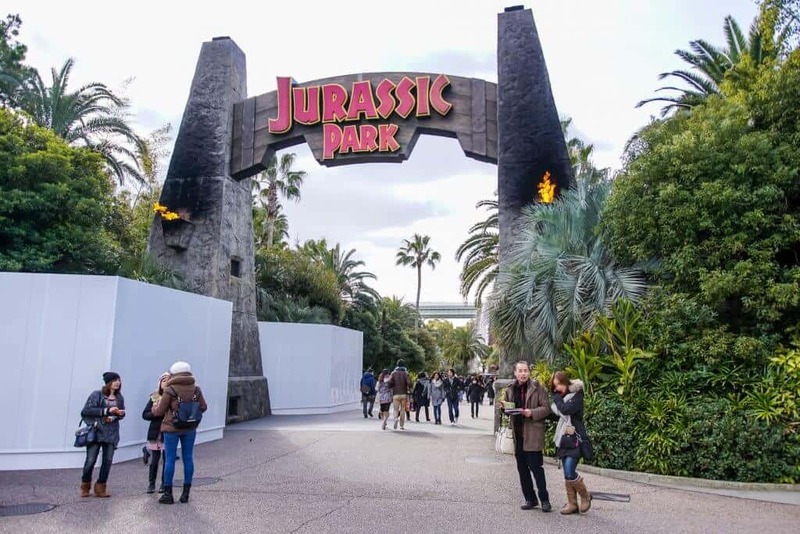 Osaka Universal Studios Japan opening hours vary widely throughout the year. It usually changes monthly. Check the hours on the date of your intended visit directly on the official Universal Studios Japan website. Generally speaking, the park opens between 8:30am – 9:30am and closes between 8:00pm – 10:00pm. Universal Studios Japan is open for longer hours during peak times such as weekends, school holidays, Halloween in October, and for the Christmas season. Although the park is open on New Years Eve and January 1st, the opening hours are greatly reduced. 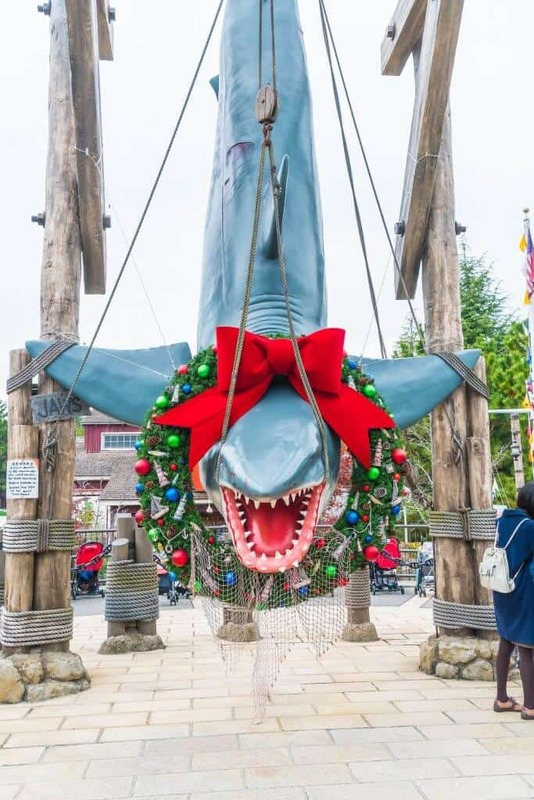 The park closes at 5:00pm on December 31st, and opens from 2:00pm on January 1st. Tickets can be purchased at Universal Studios Japan itself, but it is strongly recommended you purchase tickets in advance. These can be bought at the park, from travel agents internationally, and from partner hotels within Japan. If you’re proficient in Japanese, you can order online through the official Universal Studios Japan website. The Universal Express Passes can make a huge difference to how much you enjoy your time at Universal Studios Japan. With the Express pass, you’ll be given priority on rides, only waiting 15 to 30 minutes, even for the most popular rides. 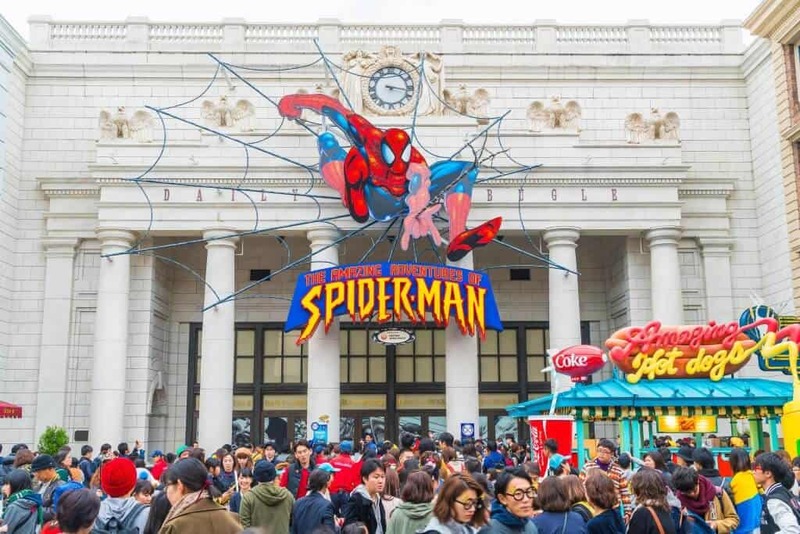 Given that visitors to USJ report an average wait time of 100 minutes for most rides and waiting times of up to 300 (!?) minutes during peak times, the express pass can make a huge difference to your park experience. 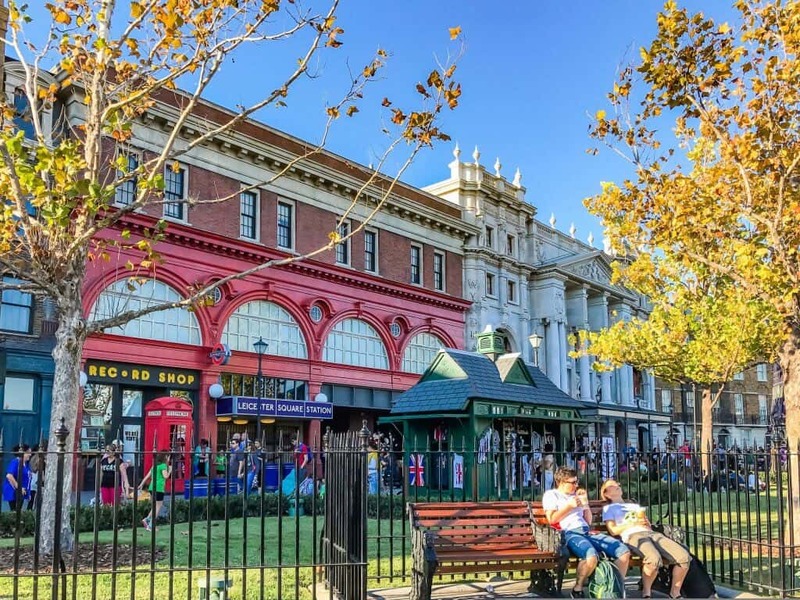 The Universal Express Pass 7 gives priority entry to seven of the park’s top rides, and includes timed entry into the Wizarding World of Harry Potter. It costs an ***EXTRA 7,400 yen. The Universal Express Pass 4 gives access to four of the park’s top rides, and includes timed entry into the Wizarding World of Harry Potter. It costs and ***EXTRA 5,000 yen. The Universal Express Pass 3 gives access to three of the park’s top rides. It doesn’t include timed entry into the Wizarding World of Harry Potter or either of the two Harry Potter rides. It costs an ***EXTRA 4,100 yen. Check the details of each pass before purchasing to make sure the rides you want are included. ***Note: The prices listed are ONLY for the express passes. This doesn’t include admission to the park. You will need to buy an admission ticket in ADDITION to this Express Pass. Universal Studios Japan is located within Osaka Harbor and easily accessible by train, bus or boat. Take the Osaka Loop Line towards Sakurajima or the JR Yamatoji Raid Service for Nara or Kamo, and transfer at Nishikujo Station to the JR Yumesaki Line for Sakurajima. It takes about 12-minutes and costs 180 yen to get to Universal City Station, a 5-minute walk from the Universal Studios Japan entrance. It takes around 55-minutes or 85-minutes to get to Universal City Station, depending on the route you take. If taking the faster, yet more expensive option, take the limited express train Haruka to Tennoji and change to the JR Yamatoji Rapid service for Osaka. Get off at Nishikujo Station and transfer to the JR Yumesaki line for Sakurajima. This option will cost you 2,360 yen, including a reserved seat on the express. A cheaper and simpler option is to take the JR Kansai Airport Rapid Service for Kyobashi to Nishikujo Station and transfer to the JR Yumesaki Line as above. This costs 1,190 yen but takes around 85-minutes. 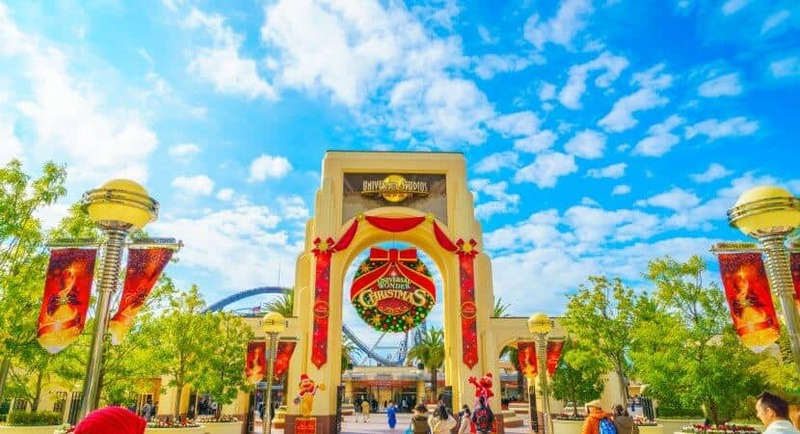 There are several ways you can go from Kansai International Airport to Universal Studios Japan, so be sure to check Hyperdia.com to find the best route for you. If traveling by Osaka’s subway, it is necessary to transfer to the JR lines to complete your journey. The Osaka Loop Line connects with the Subway at Osaka, Tenma, Kyobashi, Morinomiya, Tsuruhashi, Tenmoji, Shin-Imamiya, Imamiya, Taisho, Bentencho and Noda stations. 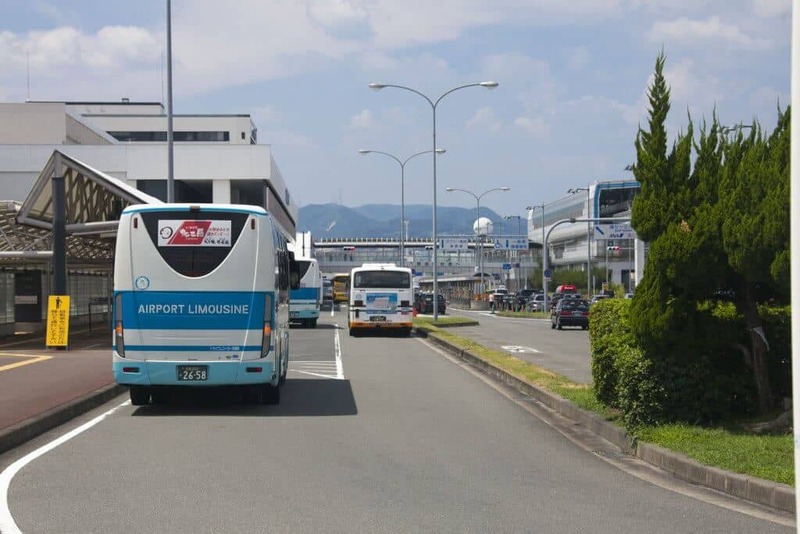 Limousine buses connect Kansai and Itami airports directly to Universal Studios Japan. The journey takes approximately 65-minutes, depending on traffic conditions. A one-way ticket costs 1,550 yen or 2,700 yen for a round-trip ticket. 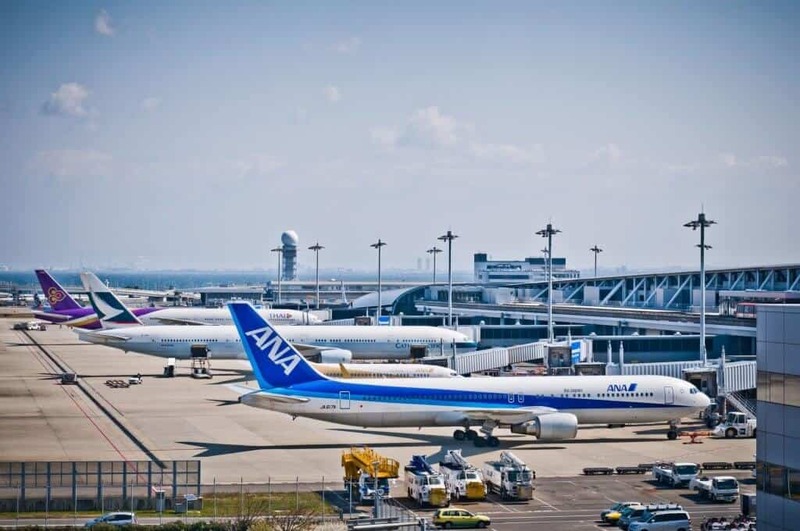 It takes around 45-minutes to travel from Itami (also known as Osaka International Airport despite only offering domestic flights) to Universal Studios Japan. There are thirteen departures daily, from 7:50am – 4:15pm. Tickets cost 930 yen each way. 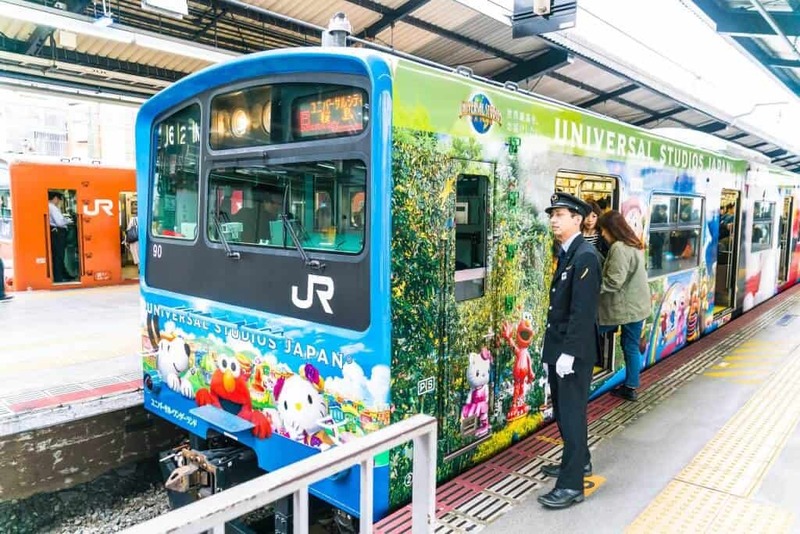 A 10-minute rapid ferry service connects Universal Studios Japan with another of Osaka’s top attractions, the fabulous Kaiyukan, an incredible aquarium. The Captain Line travels from Kaiyukan West Wharf, a 1-minute walk from the aquarium, to Universal City Port, a 5-minutes walk from Universal Studios Japan main gates. 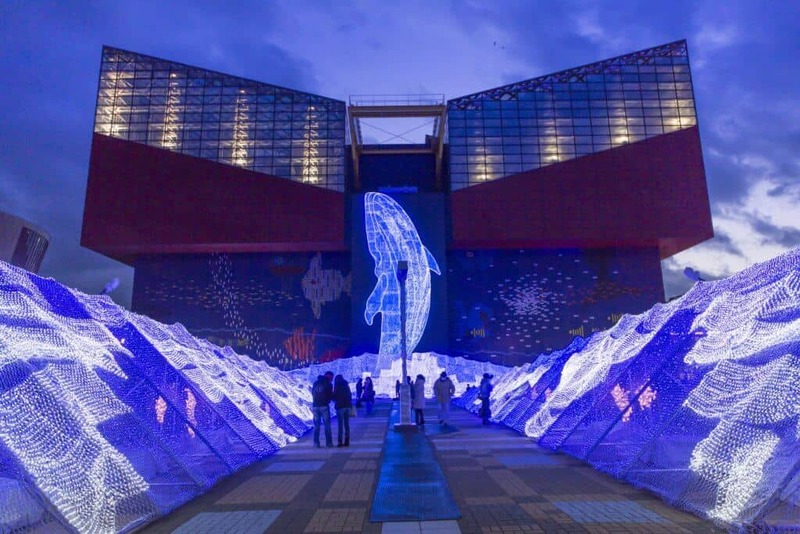 If you plan on visiting the Kaiyukan, you can buy a combined ticket for ferry and Kaiyukan entrance that gives you a discount and 100 yen off the ticket fee for the Tempozan Giant Ferris Wheel. Timing is everything. 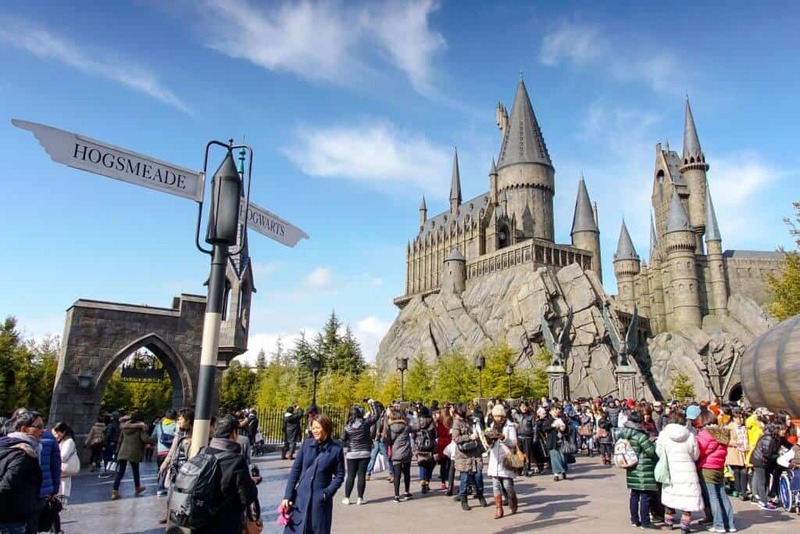 Avoid visiting Universal Studios Japan during the weekend and during the school holidays. Wednesdays and Thursdays have the lowest attendance, but even then, unless you’re buying an Express Pass, aim to get there early. A queue forms an hour before the gates open, just to enter the park. Sometimes, the staff opens the gates before the official opening time. Food inside the park is expensive, but visitors are forbidden from bringing their own food inside. Buy a substantial breakfast at a konbini (conveniece store) and eat while you’re waiting to get into the park. It’s important to stay hydrated, especially if visiting in summer. Most attractions have a separate line for solo-riders. Use these lines to jump ahead if you arent with other people. They’re typically under-used by Japanese visitors who prefer to stick with their group, even if it means a longer wait.